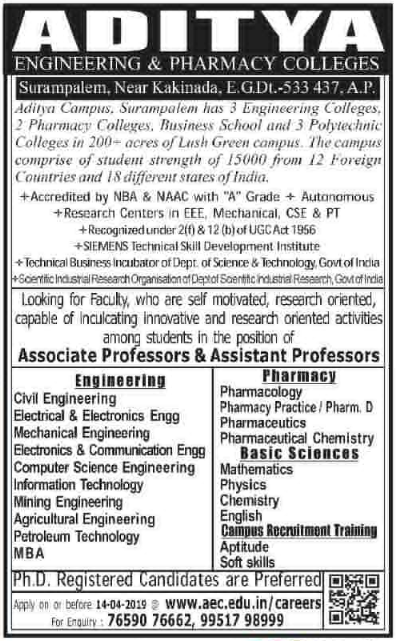 Aditya Engineering College, East Godavari has advertised in EENADU newspaper for recruitment of Associate Professor / Assistant Professor jobs vacancies. Interested and eligible job aspirants are requested to apply on or before 14th April 2019. Check out further more details below. About College: Aditya Engineering College was established in the academic year 2001-02 under the aegis of Aditya Academy, Kakinada with the approval of AICTE and Affiliated to JNTU with an intake of 180 in three UG Courses in Engineering & Technology. The College is situated in an eco-friendly area of 25.98 acres with thick greenery at Surampalem, Gandepalli Mandal, East Godavari District, Andhra Pradesh. The College is 15 KM away from Samalkot Railway Station on Howrah-Chennai Railway line in South Central Railway. The College is 35 Km away from Kakinada and Rajahmundry on ADB Road. Ph.D registered candidates are preferred.